The Communicated Stereotype » Funny Gaffe or Offensive Stereotype? Funny Gaffe or Offensive Stereotype? The recent Time Out New York January 9-15 2014 issue is of interest to readers of The Communicated Stereotype. The Stereotype Guru is always excited about reading the last page of Time Out New York magazine. More excited when it was the Sexpert Jamie Bufalino’s Get Naked column, but still of interest now that it’s the New York City’s Top Ten list. So I was reading it this time around to find out the top ten “mayoral gaffes, blunders and scandals.” I found two particularly of interest to TCS readers. On Groundhog Day in 2009, Mike Bloomberg made the annual mayoral pilgrimage to the Staten Island Zoo to coax resident Charles G. Hogg out of his cage. But Charles wasn’t in a prophesying mood, which he communicated by biting Bloomberg’s finger. Fortunately, Bloomie — who described his attacker as a “terrorist rodent that could very well have been trained by Al Qaeda” — was wearing gloves. In February 1969. a blizzard dumped more than a foot of snow on the city. More than a week later, Queens had still not been plowed, so John Lindsay went to survey the scene, to shouts and boos from onlookers. In Fresh Meadows, one supportive woman told Lindsay that he was a wonderful man. “And you’re a wonderful woman,” he responded. “Not like those fat Jewish broads up there.” D’oh! What I find most interesting about these “gaffes or blunders” — they don’t seem to be scandals — is that I am unclear which part qualifies as the gaffe or blunder. In #2 was it that his finger was bitten or that he stereotyped the groundhog? In #3 was it that he took so long to plow Queens or was it that he stereotyped Jewish women? In #3 it seems that it is more likely the latter, but in the first one it seems to be able to go either way. If the authors are including these two vignettes because of the stereotypes that were communicated, then do they consider them gaffes or blunders or both? Either way, does that do justice to what they were? In my book The Communicated Stereotype: From Celebrity Vilification to Everyday Talk, published this past July, I argue that it is more productive to treat communicated stereotypes as gaffes or blunders than racist, homophobic, and so forth. I use the theorist Erving Goffman to support my claim with his discussion of gaffes, civil inattention, face threats and so forth which affect impression management. Yet, I am struck by seeing this expressed so nonchalantly by the media. The hallmark of a politically correct society is vilifying celebrities who communicate stereotypes. Yet, this was not a vilification in any sense. If anything, it’s dismissed as nearly adorable. Like when a child does something wrong that adults look back on and laugh because it was so cute. 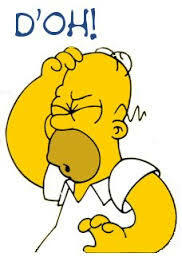 The use of Homer Simpson’s famous quote “D’oh!” reinforces that these communicated stereotypes be viewed as something cartoonish and comic. Perhaps this small nearly insignificant and easily overlooked magazine article provides a glimpse into the post-politically correct society of the future. A time in which communicating a stereotype is not something to be fired or otherwise penalized over but rather something to be pitied or mocked because of. So the title leaves it to you the reader to decide. Where do you stand? Are you politically correct or post-politically correct?